We may arrange for a physical group ritual that will be enhanced and empowered by the uprising of like-minded energies coursing through the planet, as well as enhanced and empowered by those spiritual beings around the world participating in the Aries Festival, any time up to 12 hours prior to, or within 12 hours after the full moon. You may review SouledOut.org's Aries Global Meditation and Alignment for use in creating your own unique ceremony. Invite participants to cleanse and purify prior to the ritual through a purification meditation, a walk in nature, and / or a ritual herbal bath. As each one arrives, they are called to bring and add to a holy space for the gathering. Sanctify the ritual space, setting the stage for connecting with the group soul with a dedicated altar, saging, incense, and reflective or uplifting recorded music. Once all have arrived, bells may be sounded to call people to the meditation circle, or once everyone is seated, to unify attention. For the altar ... fresh spring flowers are always appropriate for this ritual. Themes of renewal and resurrection may be depicted in the items you place on the altar: colored cloths, symbols, statues, icons and minerals arranged in a manner that relates to the significance of the Aries Festival and the gathering itself. Hallow the space and time with a group prayer, invocation, sacred sounds and / or singing a song. During the gathering, songs can be sung together by the participants. Singing the Vision in unison aligns our hearts and souls in potent and magical ways. A Meditation Focus on the Theme of Resurrection, appropriate to this Festival. Taking turns, individuals may read these words along with the corresponding affirmations. As each one is read, each person may light a candle on the altar or in the room to seed these qualities in their own lives, as well as for the entire world. Afterwards, a still space may be held to strengthen the vision. Audio pieces on the Festival of the Risen One Listen to these in preparation for and leading up to the meditation. 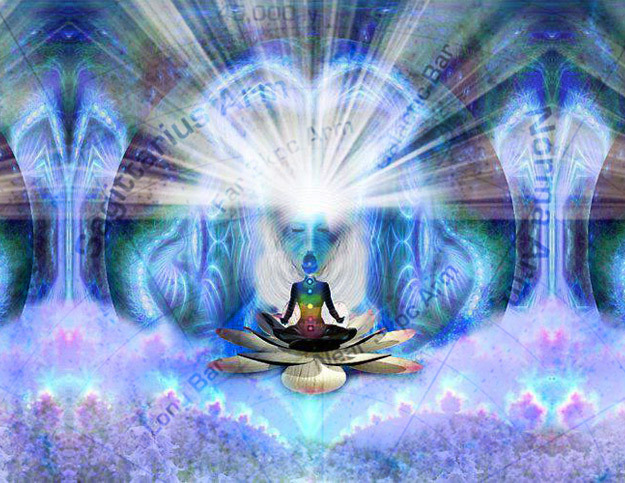 The key element is a guided meditation to connect the group to the Planetary Soul, leading into a time of silent meditation. Following the meditation, all may share impressions received. The Principle of Sharing is invoked by collecting donations for an organization or cause outside your own that is making a positive difference in the world. This deepens our experience of selfless service, and our connectedness to the greater world vision. To open or conclude the ritual aspect of the gathering, the The Great Invocation may be recited by all. These ideas may all be used or not, arranged and adapted to suit the needs and temperament of those participating in the ritual. There is an elegance in simplicity, you may find that "less is more" in deciding which components to include. The space held by whomever is hosting the meeting, being relaxed and in present time prior to the arrival of guests, assists with building the channel for the group's inner plane alignment.